Heroic deeds. Monstrous acts. Events that will leave one woman’s world spinning out of control. As a writer, I enjoy creating character-driven storylines. In doing so, I often sit back and watch, much like a parent, as my characters (children) make choices I know they shouldn’t, that I’m sure I wouldn’t. I sometimes flinch and look away wishing they’d made different choices, replaying in my head the ‘what-ifs’ of the alternative paths they could have taken, the heartbreak they could have avoided. But I love my characters, and my children, so I let them learn from their mistakes, as we all must. Our life stories the richer for doing so. Yet, there is always another side, a caveat. Sometimes we don’t recognize the fallout of our decisions until much later, after all the puzzle pieces have snapped into place. How a seemingly innocent choice, or encounter, marked the moment our lives spiraled along a new trajectory, for better or for worse. As those who have lived long enough know: hindsight is twenty-twenty. Chain of Title is just such a tale. The main characters have all lived long enough to know better than to make the choices they do. Yet, they get stuck in moments of time, like real people, unwilling to forgive betrayals, unable to let go of blind rage or lost love, incapable of walking away from a thorny past. Two particular scenes in this story were difficult for me to write. I struggled with them for days, bartering, trying to come up with ways around what I knew in my gut was about to happen, what I knew had to happen. In the end, I relented and allowed the characters to commit the ultimate betrayals and monstrous acts, acts in opposition to their previous heroic deeds; the contrasts startling. I did not do this to shock the reader but instead to remain true to the characters. I let them tell their stories, live their own lives, and bear the burden of the consequences. “Just tell me which side you work for,” Shayna asked without judgment. A stunned expression colored Sean’s face, then he laughed, shaking his head in apparent disbelief. She knew he was laughing at her naïveté. His hands reached for her face, thumbs caressing her high cheekbones, his expression now stony serious. “Good or bad? Right or wrong? That’s what you’re asking me?” The deep rumble of his voice plucked the strings wound tight in her body since this nightmare had begun. “You’d be surprised how often you can’t tell the difference. How often they want the same thing,” he said quietly in the dark, pushing her further away. She processed his words as the pieces of the puzzle began to snap into place, and then she suddenly felt awash with guilt. Thank you for taking the time to read my blog post. If you're a fan of romantic suspense, I hope you'll consider Chain of Title. 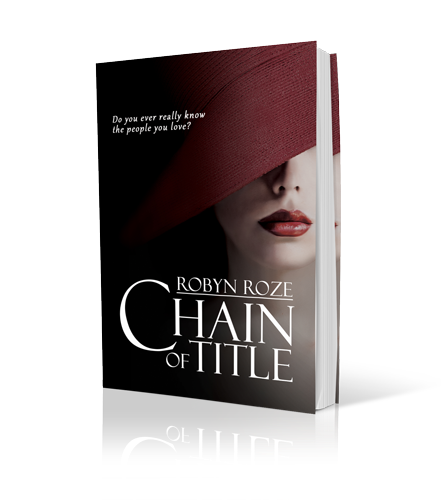 I’m offering one lucky reader who comments on this blog post a Kindle copy of Chain of Title. Just Romantic Suspense will randomly select the winner. Good luck! Giveaway ends 11:59pm EST June 15th. Please supply your email in the post. You may use spaces or full text for security. (ex. jsmith at gmail dot com) If you do not wish to supply your email, or have trouble posting, please email maureen@justromanticsuspense.com with a subject title of JRS GIVEAWAY to be entered in the current giveaway. this sounds very intriguing ;) congrats to Robyn on the new release! Thanks for sharing! It sounds like a very interesting story with some twists in it. Thanks for the excerpt. Sean sounds like the kind of man I want to know more about so I have to read this. What you said is so true. There are periods in my life where I just froze and can't move on. It takes me a few days just to realize what is holding me back. Thanks for the book description, excerpt, and giveaway. I love the sound of this. Intrigued by the title too. Thank you for your comment, Mary. :) The title has two meanings in the story. If you read it, you'll make the connection. Good luck in the giveaway.